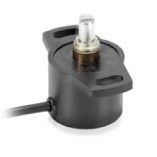 Very compact sensor series with 13 mm diameter housing and high accuracy. Compact 16 mm body diameter and high accuracy with 14-bit resolution. Consumes as little as 300 µA current (no load), 3 mA current (start without load) in a 22 mm diameter housing. 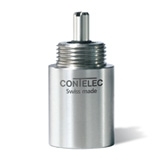 High resolution of ±0.09° and has programmable linear or non-linear output feature. Programmable angle span, accuracy to ±1°, high EMC tolerance and -40 to +125°C operating temperature range. This series features robust sensors with aluminum housing, repeatability of <0.15% and programmability. These precision servo mount potentiometers come in a 22 mm package and have resolution of <0.015°. Precision servo size 11 potentiometers with extremely low starting torque of 0.003 Ncm. Precision servo size 13 potentiometer series with repeatability to 0.007°. Precision servo size 20 potentiometer series with repeatability to 0.007°. 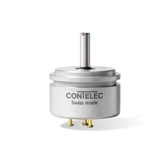 Robust metal housing industrial grade potentiometers with repeatability of 0.007°. Very durable angle sensors with stainless steel shafts and anodized aluminum housings. 0 to supply voltage, redundant output avail. This category combines absolute angle measurement Hall effect sensors and potentiometric sensors with resistive elements – including rotary potentiometers and panel mount types. 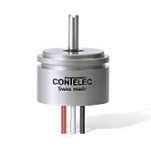 Sub categories include low torque, precision, heavy duty, geared potentiometers, auto sport, magnetic encoders and more. Very compact 8.45 mm dia. housing. Wirewound potentiometer with housing dia. of 20 mm and repeatability of 0.35°. 13 mm diameter potentiometer with repeatability of 0.02°. Bushing mount potentiometer with repeatability of 0.1°. Bushing mount potentiometer with resolution and repeatability of 0.1°. Wirewound potentiometer with housing dia. of 20 mm and repeatability of 0.11 %. Very robust and high-accuracy angle sensors, some models are programmable. High accuracy magnetic angle sensor with elongated holes for easy mounting. Some models are programmable. The P2500 Multi is a multiple section version of the proven P2500. 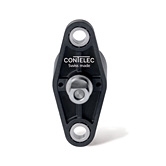 Very robust magnetic angle sensor with single, partial and fully redundant models. 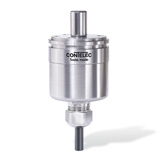 This non-contacting series of rotary sensors feature solid shaft or semi-hollow-shaft versions, repeatability of less than 0.1° in a very robust housing.